Firefighters from Bedminster Fire Station visited Greenfield Academy today (Tuesday 21 February) to support the school children with their reading and celebrate their recent reading achievements. Avon Fire & Rescue Service (AF&RS) is supporting this year’s national Read Aloud campaign. The project, led by the International Literacy Centre, is designed to raise awareness about literacy issues facing young readers across the country. 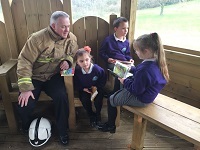 The school children had the opportunity to demonstrate their reading abilities by reading out loud to the visiting firefighters before being presented with certificates. The Blue Watch firefighters were presented with their very own certificate from the children at the school which will take pride of place back at the station. The visit concluded with a tour around a fire engine and spraying water from a hose.